Global Pet Expo…Here we go! 24 MarGlobal Pet Expo…Here we go! As I posted yesterday, we are headed to the Global Pet Expo! Since it isn’t too far away from our home in South Carolina AND we have a ton of #NEONlitter glowing goodies, we decided to drive. As a team. In one car. I’m about to lose my mind. Who knew Donald had such a thing for crunchy snacks? Or that Linda has such a small bladder? The more you know folks! 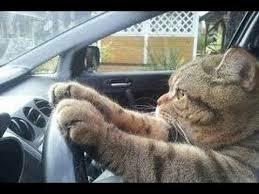 Meanwhile, as the BOSSCAT and CEO I have been continually pleading my case to get behind the wheel. I need to show these twiddling turtles how to actually move like a cat! At the pace we’re going, we’ll miss the opening celebrations and happy hour…and you know how I feel about that, mmk? Any tips? Should I just call it and double-up on the melatonin until we arrive? At least these goons don’t have me in one of those annoying “pet carriers”—I don’t care if my mine is gold-plated, thank you very much. It’s still a cage not fit for this king! Anyways…off we go. I need to get off my cell; it makes me nauseous when we’re driving. Wish me luck and see you on the road!